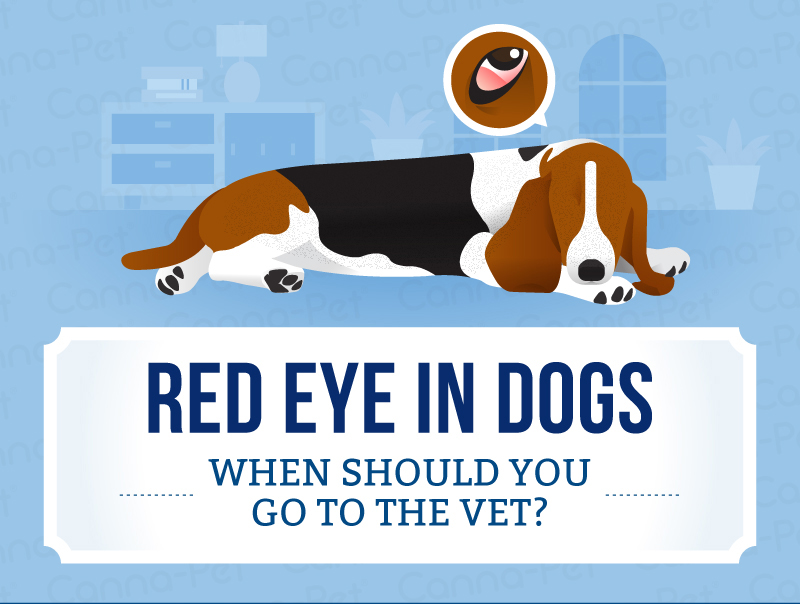 Home Blog General Red Eye in Dogs: When Should You Go to the Vet? Your heart normally melts when your dog looks up with those loving puppy-dog eyes – until you see something’s not quite right. Your dog’s eyes are red and bloodshot. Is it time to go to the veterinarian? Short answer: maybe. If you’re worried, it is always a good idea to get a proper diagnosis. You will rest easier when your vet figures out why your dog has red eyes, and your dog will be a lot happier if he is cured. Furthermore, things can go downhill in the “blink of an eye” and it is better to be safe than risk your dog going blind. It is especially critical to keep track of your dog’s eye health if he has pre-existing health problems like allergies and genetic risk-factors, or is prone to infections. What Causes Red Eye in Dogs? Dogs get red eyes for a lot of the same reasons that people do. Some reasons are relatively harmless – like allergies or dryness. Other reasons, like eye infections or glaucoma, are emergencies that need immediate treatment to avoid permanent vision loss or blindness. If your dog has red eyes and is blinking, squinting, tearing up and avoiding bright lights, there may be something in his eye. You may be able to determine this by gently lifting his eyelids to check for debris, scratches, or bleeding. If your dog has red eyes but otherwise seems healthy, it may be a less obvious problem. Long-haired dog breeds can get eye redness if the fur around their eyes is poking and scratching the eyeball. And while many pooches love sticking their head out of a car window, bugs and dirt can hit them in the face, or the wind can cause severely dry eyes. You should always talk to your vet to get at the root cause of your dog’s eye redness, because some problems can cause blindness in dogs or the loss of an eye without treatment. As a general rule of thumb, eyes that are more bloodshot are more likely to be a medical emergency. The white part of a dog’s eye is normally pristine white – but sometimes you might see a blood vessel meandering across the surface. Red eyes are not normal, especially if they do not go away in a few hours. If you are not sure how much of the eye is affected, gently lift the eyelids and look for rosy-colored, pinkish or bright red instead of white. The following conditions can also cause red eyes. 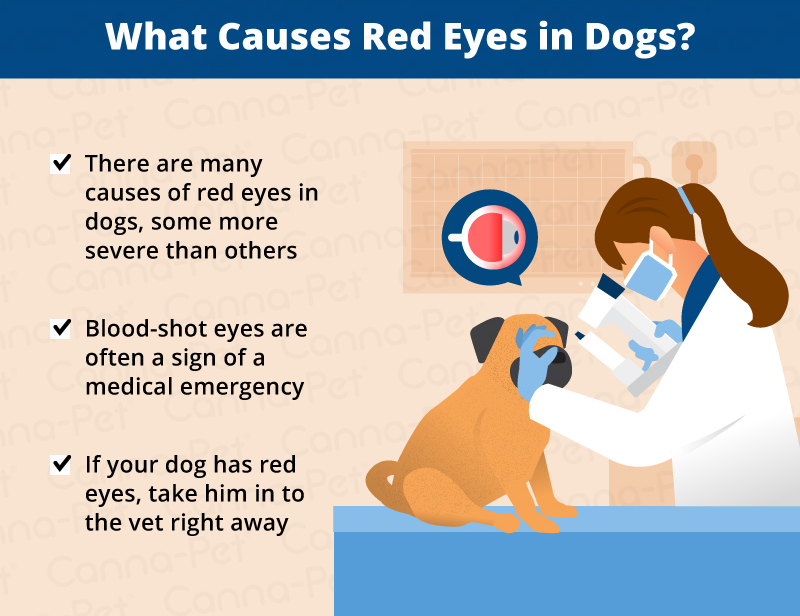 Red eyes in dogs might be conjunctivitis (also called “Pink Eye”), an inflammation or infection of the outer membrane of the eyeball and the inner eyelid. Symptoms of conjunctivitis in dogs include eye redness, mucous, yellow-green pus or a watery eye discharge. There are many things that can cause conjunctivitis in dogs, including allergies, injuries, birth defects, tear duct problems, dry eye, distemper, or even tumors in rare cases. Red eyes are a common symptom of eye infection in dogs. Just like in humans, a lot of things can cause dogs to get an eye infection. Dogs can get red eyes from viral infections like distemper, herpes, hepatitis and the flu. Bacterial infections that cause red eyes include brucellosis, leptospirosis, and tick-borne diseases like ehrlichiosis or Lyme disease. Red eyes can also be caused by fungal infections. If your dog was in a fight with another dog or another animal, you may find bruising, scratches, or bite marks around his eyes. Because these injuries have a high risk of infection, you should take your dog to the veterinarian the same day. In the meantime, you can also put a cool compress on his eye for 10 minutes to reduce swelling and pain. Unlike humans, dogs have a third eyelid that can develop redness if debris is trapped under the eyelid. If this is the case, you probably will not be able to see the debris. A vet will need to identify and remove it. If you do notice something in your dog’s eye that needs to be removed – but it is not penetrating the eye – you can try to flush it out with clean water or carefully use a damp cotton swab. If you can’t remove the object, or if your dog won’t sit still, take the dog to a veterinarian for help. If you see an object that has penetrated the eye, your dog needs to go to an emergency vet right away. Before you go, put a bandage over the eye, or an Elizabethan collar (plastic cone) if you have one to keep your dog from scratching the eye and making the problem worse. You should also go to the veterinarian if you see a scratch on the eye. Before you do, immediately cover your dog’s eye with a clean damp cloth, bandage the cloth to the dog’s head, and put an Elizabethan collar on him to prevent further scratches. Take your dog to the vet the same day if possible. If a dog with red eyes was exposed to toxic chemicals, he may have a chemical burn. You will need to flush the eye with clean water for 10 minutes and bring your dog to the veterinarian for an examination. It is also a good idea to bring the chemical’s container to the veterinarian, so he or she knows exactly what is causing the red eyes. If you are not sure what chemical your dog was exposed to, there are some commons chemical that may be the culprit. Laundry detergent or soap residue in carpets or bedding sometimes cause red eyes in dogs. Dogs can also get red eyes from sniffing cleaning chemicals (bleach, window cleaner, etc.) or getting into chemicals in the garage, like pesticides or lawn-care fertilizers. Dogs with red eyes may also have physical problems, like eyelid swelling. Eyelid swelling is usually a sign of a physical injury, like hitting a twig while running, over-scratching, or getting into a fight with a cat or another animal. If your dog’s eyelid is swelling, see a veterinarian to check if the surface of the eye was damaged. Glaucoma is one of the most serious reasons why dogs get red eyes. Glaucoma in dogs occurs when pressure builds up inside the eyeball like an over-inflated balloon. This can damage to the retina and cause permanent blindness if the pressure is not reduced, so seeing a vet is a must. Dog breeds that are more likely to get glaucoma include American Cocker Spaniels, Basset Hounds, Terriers, and Arctic breeds. Corneal ulcers (also called “ulcerative keratitis”) are painful open sores on the front surface of the eyeball that will cause your dog to get red eyes. They usually occur from direct injury to the eyeball or from an infection with bacteria, fungus or a virus. Dogs can also get corneal ulcers from chemical burns if they were sprayed in the face. Corneal ulcers can cause blindness and they must be treated at a vet. Like people, dogs can get red eyes and sniffles from breathing in allergens such as dust, pollen, mold and mildew. Your dog may suffer from allergies seasonally or year-round. Allergies may seem innocent enough, but it is still a good idea to go to a veterinarian because many eye conditions resemble an allergy and it can be hard to tell the difference. If an allergy is indeed the diagnosis, your veterinarian may prescribe anti-inflammatory medications, antihistamines, or seasonal allergy shots. Dry eye syndrome, also called keratoconjunctivitis sicca (or KCS), is dryness of the lining of the eyelid, eye covering, and cornea. If your dog suffers from this condition, a veterinarian may prescribe specially-formulated canine eye drops (“artificial tears”) and anti-inflammatory medications. Some medications can also stimulate tear production to mitigate eye redness. Tear duct problems can cause the area around the eye to become red, irritated, or swollen. Redness can occur due to lack tears because the duct is blocked. If you think your dog has a blocked tear duct, you need to go to the veterinarian for an in-depth eye exam to find out what is causing the problem. Blocked tear ducts can be caused by scar tissue from an infection, inflammation of the tear sac, injury to the eye, tumors, birth defects or an eyelid turned inward. Dogs can get red eyes from swimming in the ocean, stream, lakes and pools. This is usually due to irritation from salt-water or bacteria in fresh-water. Ponds and lakes may also contain toxic blue-green algae, or dangerous chemicals like fertilizers, pesticides and herbicides. Just like people, dogs who spend a lot of time swimming in chlorinated pools commonly develop red eyes, itchy skin, or even lung irritation – especially if the pool is located in a poorly ventilated area. Eye redness after swimming usually goes away on its own within a few hours. If the redness does not go away, your dog may have an infection or a chemical burn on the eye that needs to be seen by a vet. Uveitis is an inflammation in the interior part of the eyeball. The symptoms include eye redness, cloudiness, blood inside the eye, and sensitivity to light. If any of these symptoms are present, you need to take your dog to the veterinarian. Many things can cause uveitis, and if left untreated, it can lead to blindness. Fortunately, uveitis is treatable with oral steroids and glucocorticoid steroid eye drops. Dogs with red, bloodshot eyes that look glassy may have canine distemper. These dogs usually have other symptoms like weakness, discharge from the eyes and nose, dry cough, fever, and lethargy. The canine distemper virus is highly contagious, as it spreads in the air – though puppies who were immunized with the distemper vaccine have a very low risk. In non-vaccinated dogs, or dogs with vulnerable immune systems, distemper can cause death in as few as five weeks. A prompt diagnosis and treatment by a veterinarian is critical. Infectious canine hepatitis (liver inflammation) is a disease in dogs that is caused by a virus. Unlike hepatitis in humans, canine hepatitis frequently damages the eyes and causes one of the most obvious symptoms – “hepatitis blue eye” – in which the iris turns blue and the whites of the eyes turn red. The eye redness is caused by inflammation and the death of cells in the front of the eye (anterior uveitis). About 20% of dogs with hepatitis develop eye inflammation and corneal swelling. It sometimes progresses into glaucoma with corneal ulceration – resulting in permanent vision loss or blindness. If you see any of these symptoms in your dog, go to the vet immediately. Are Some Dog Breeds More Likely to Get Red Eyes? 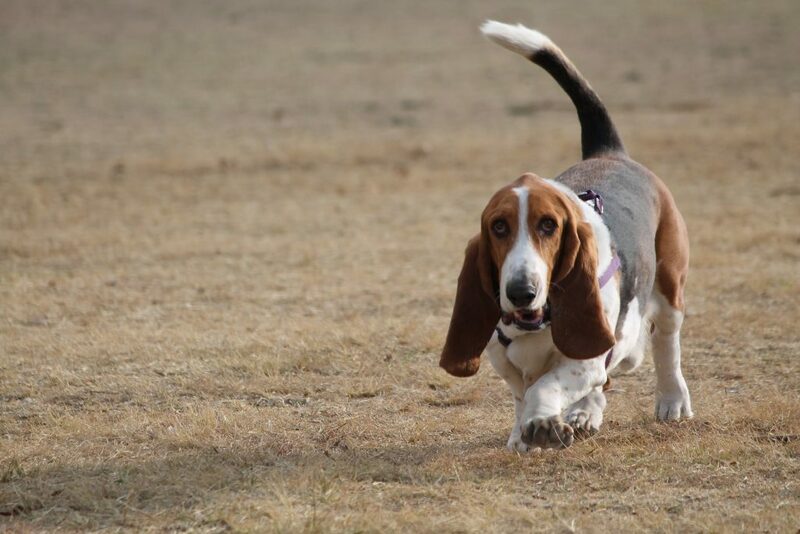 Some dog breeds – such as Bloodhounds and Basset Hounds – tend to have red eyes all the time. This is usually a result of the eyelid drooping so far that the eyelashes rub against the eyeball and cause irritation, a condition called “entropion.” This is normally not an issue, as long as there is no discharge and the dog does not seem bothered, but it should still be checked out by a veterinarian because it could lead to an infection. Certain dog breeds are more likely to get red eyes because of dryness or blocked tear ducts, like Poodles and Cocker Spaniels. Treatment is not always necessary – but your dog should always be seen by a vet. Short-nosed dog breeds, such as Shih Tzu, Pekingese, Maltese, and Pugs, are susceptible to developing red eyes as a result of ingrown hairs in the skin folds around the eyes. Your veterinarian will determine the best way to treat the underlying problem. Some eye conditions will heal on their own, while others require surgery. For example, surgery may be necessary for puppies who have red eyes because the tear ducts did not open normally during development. Red eyes are fairly common in dogs. The reasons could be many. It’s always best to be safe and have your dog checked out by a vet. “What Makes The Whites Of Your Dog’s Eyes Red?” Cuteness, Accessed 20 Sep. 2017. https://www.cuteness.com/article/whites-dogs-eyes-red.